The following guest post is an interview with Daryl Yerdon, owner of Kelley’s Korner Orchid Supplies. He is an expert on orchid care and has a wide selection of high-quality products on his website including pots, baskets, humidity trays, and pre-made potting medium to name a few… I highly recommend you check out his website Kelley’s Korner Orchid Supplies to see his wide selection. Ryan: How did Kelley’s Korner Orchid Supplies come about? located in Milford NH where I live. Where Can I Purchase Your Orchid Supplies? Ryan: Do you have a retail location our readers can visit? Daryl: We don’t have a retail location but in addition to our website Kelley’s Korner we sell supplies at many orchid shows throughout the Northeastern United States. 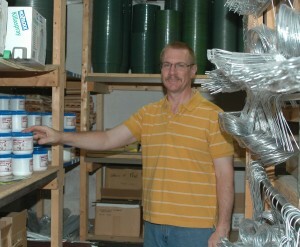 Daryl: I’m very proud of our custom orchid mixes that we manufacture and package for our customers. We make three orchid mixes with fir bark as a main ingredient. Our “Cymbidium–Phalaenopsis Mix” is created with medium fir bark, sponge rock and a very special “chunky” peat moss that we bring in from Canada. The chunky peat provides moisture needed for orchids like phals that don’t have a pseudobulb to store water for long periods of time. Our “General Purpose Mix” is made from medium fir bark, sponge rock and charcoal and is recommended for orchids such as Cattleyas and Dendrobiums. The “Paphiopedilum & Seedling Mix” is created from fine fir bark, perlite, sphagnum moss and small charcoal. Because they grow in the ground paphs need a tighter mix than orchids which grow in the wild with their roots exposed. We also have a mix we call “KK Special Orchid Mix” that is made from coconut husk chips, diatomite, sponge rock and charcoal. Because the coco husk holds moisture so well it’s very popular with people who grow in the home. In my humid greenhouse I prefer the bark mixes but many customers that grow indoors or under lights tell us they like to use the moisture retentive coco husk in these drier environments. Ryan: I noticed you feature humidity trays on your website. Can you talk about the benefits of both the Gro-Pro and Humidi-Grow Humidity Trays? Daryl: Our Gro-Pro and Humidi-Grow trays are one of our most popular items. For many indoor growers it’s often a struggle keeping humidity high and also somewhat of a hassle to water their plants. No one likes to carry each orchid one at a time to the kitchen sink, and orchids should never be left sitting in a saucer of water because it soaks up into the pot and makes the mix too moist. With your plants sitting on top of a Gro-Pro or Humidi-Grow tray you can simply water and let it drip right into the tray underneath. No more hassle of carrying plants to the sink or worries about damaging your table or windowsill. And the water that drips into the trays will provide a little extra humidity in your growing area which is always a benefit to orchid growing. 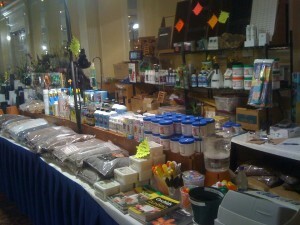 Ryan: You offer an incredible assortment of pots and containers. What pots and baskets do you recommend for beginner orchid growers? Daryl: This is one of my favorite areas of the website so I’m glad you noticed all the styles we carry. We continually look for new pots and there are now some great designs made just for orchid growers. Some have tapered bottoms to drain the water away and our newest pots have slits in the side in addition to holes on the bottom. We look for pots with good drainage because you never want your potting media to be standing in water. I think one of the biggest contributors to poor orchids is bad root growth caused by soft potting mix and that’s why you want your pots to always drain properly. We have many styles of “see-thru” pots and I highly recommend them. The clear pots allow you to see the condition of the roots and your orchid media. Because it’s believed that some orchids produce photosynthesis in the roots, an added benefit of clear pots is that they allow light to pass through. My Phaleanopsis do especially well in the clear pots and I love them because I can see the roots to make sure they always look plump and healthy. We also carry all sorts of plastic baskets and net pots, square and octagon wooden baskets. We even import our neofinetia and cymbidium pots all the way from Japan. Ryan: Do you grow orchids? Where do you grow them? Daryl: I have about 400 orchids I grow in an 18’ x 24’ gothic arch greenhouse that I built myself. During the summer many of them are moved outdoors and covered with a shade cloth. Two years ago I built a light stand in my basement so that I could grow orchids that like colder temperatures. Each shelf holds four of the Gro-Pro trays we talked about earlier with a single T-5 light fixture above. My cooler, humid basement is the perfect environment for many Masdevalias and Pleurothallids. I can’t grow these in the greenhouse but under lights in my basement I’m having great success. Daryl: That’s a tough question to answer! My favorite orchid family is probably the Paphiopedilum. I first started growing on a windowsill and paphs are lower light orchids so they did much better than the Cattleyas I was trying to flower. Now that I grow in the greenhouse I still have an entire bench dedicated to paphs anyway. They are easy to grow and when they do flower most of them last for a long time, some up to a couple months on the same flower. Even though we don’t sell orchids, I still like to create an orchid display when we sell supplies at orchid shows. With a bench full of Paphiopedilums I’m almost guaranteed to always have blooming plants available when we go from show to show sometimes many weekends in a row. Daryl: For the best growth and flower quality, orchids need to be fertilized regularly. For many years I just fertilized now and then and sometimes even forgot to do it for weeks or even months. I realize now that my orchids did much better once I began to fertilize properly. There are many fertilizers out there and they all have their followers, just be sure to use a fertilizer that is labeled for orchids. I prefer the “MSU” fertilizer created by Michigan State University. Regardless of which you use, be sure to fertilize regularly but never too much. Over-fertilizing can create all sorts of problems so orchids do far better with too little fertilizer than too much. But if you give them nutrients on a regular basis you’ll definitely have much better blooms. Ryan: Any other advice you’d like to share? Daryl: Many of us are fortunate to have a local orchid society or annual orchid show within driving distance. Almost everything I know about growing orchids I learned by joining the New Hampshire Orchid Society. Attend the monthly meetings, listen to the speakers, and volunteer to ribbon judge at an orchid show. Orchid growers love nothing more than talking about orchids and there’s no better way to learn about growing them. Daryl Yerdon is the owner of Kelley’s Korner Orchid Supplies and has been growing orchids for over sixteen years. In 2009 the New Hampshire Orchid Society awarded Daryl with the Sawyer Family Advanced Grower Trophy recognizing him as an expert grower for the NHOS. 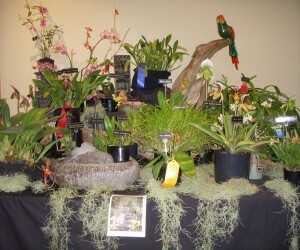 Daryl frequently displays his orchids at many local orchid society shows, where several of his plants have received Certificate of Cultural Merit awards from the American Orchid Society. Daryl is able to bring his expertise and experience growing orchids to Kelley’s Korner and is happy to assist others with questions about orchid supplies and care. And remember, by signing up as a member of the Green Thumb Club today, you’ll save 20% on Kelley’s Korner Orchid Supplies. After becoming a member, you’ll get access to a special coupon code (not available to the public) which you can use to get the discount off the site.